You could say that this week’s tomato harvest was a bit overwhelming. When you stand at the end of the row seeing the endless amounts of ripe tomatoes, it is easy to believe that “it will never end.” Maintaining focus until the project is complete can be very difficult and exhausting. 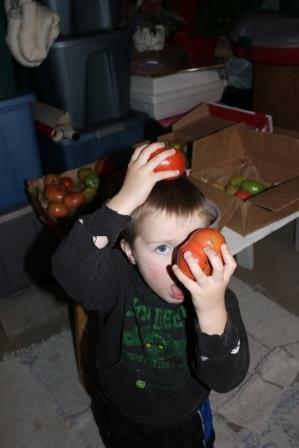 When I asked the boys to weight the tomatoes after they were unloaded, they wondered why, and what was the purpose. But once completed, they were amazed by how many pounds they had harvested. Last weeks harvest of 209 pounds not only provided for all of the shareholders, but also yielded 84 pints of salsa. I wonder how many quarts of tomato juice this week’s will yield? Spinach – Mix together with the above lettuces for a beautiful colored salad. Kennebec – Excellent for baked potatoes. 1. Beat sugars, oil, eggs and vanilla together. Mix dry ingredients. Stir into mixture. Add chocolate chips and shredded zucchini. 2. Pour batter into 4-5 mini loaf pans (or 2 large loaf pans), coated with cooking spray. 3. Bake at 350 degrees for about 45 minutes, or until toothpick comes out clean. Remove from pans and cool. We harvested the pumpkins last Friday, and it was quite muddy out there. But the boys didn’t seem to mind at all. Another growing season is quickly coming to an end. We are happy that a nice weekend is predicted so that we can get a lot of clean-up done in the field. We have received a couple of inches of rain the last few weeks which makes for some muddy harvesting conditions. The boys don’t mind as long as hot chocolate follows. Many of you asked how my trip to Washington D.C. went. Every trip is different and full of meaningful conversations of farmers sharing with our elected officials and leaders in D.C. how legislation and regulations are personally affecting them on their farms. These conversations do have meaning and do matter. Just think about it…what affects a farmer in southern Minnesota will be different from northern Minnesota and will be different from farmers in South Carolina and Oregon. That is why it is so important to share our stories. That is also why our children have also shared comments when regulations will affect their opportunity to farm when they grow up. This is all quite funny when I look back upon my childhood conversations about politics. They were the dreaded holiday conversations between my two grandpas – one Democrat and the other Republican. Most of the time during these heated political discussions, I sat more amused that the conversation didn’t come to blows, but rather ended with them departing in a congenial manner. Even thought I know they walked out the door thinking that the other one was absolutely wrong! So the thought that politics has become a regular part of my job, part of our family discussions and part of something we need to monitor for our CSA is interesting. In fact, it is essential that farmers are actively involved so in the future, farmers have the ability to provide food, fiber and renewable fuel for consumers. If you’re not at the table, you’re on the menu. As I reflect on the past week, there are three things that stick out which I think the picture below captures: God, Country, Farmer. Farmers are for the most part optimists with their reliance on God to be with them. Farmers are very proud to be an American and proud to raise food, fiber and renewable fuel for consumers. The pride in our country and the pride in our duty as farmers is an inborn fondness that runs deep in many cases – many generations deep on farms across America with a priority to be sustainable in order for future generations to continue the traditions. We weighted the milk-fed pumpkin, and it was one of the heaviest if not the heaviest weighting in at 58#. The other big ones were 30-40#. We want to tweak this experiment next year and see where we end up. Lettuce and Spinach – Enjoy this mix on some BLTs or salads. Carrots – We are having a healthy crop. Hope you are enjoying them. Beets – This is the last of the beets for the year. Look closely and you will see young green beans growing where the flower once was. The flower is still wrapped around the young green bean which is attached to the stem. Green Beans – A new crop of green beans. Giving this cabbage a try in the field. The boys said it was mighty tasty. The heads are smaller due to the insect pressure which caused the plant not to produce a head earlier. But it’s a good size the refrigerator and a meal. Purple Cabbage – I soaked the cabbage in salt water so hopefully you should not have any insects in these heads. They are a nice size for a meal. Here are some ideas from Taste of Home. Garlic – We planted garlic last fall and harvested it mid summer and let it dry for a while. We are planning to plant some more this fall with the hopes that the harvest is more bountiful in 2016. Peppers – A few green peppers with the small Habanero peppers. Choose a few tonight. Fun facts about peppers. Tomatoes – Tomato varieties included in your boxes: Yellow Girls, Honey Delights, Big Boys, Roma, Fourth of July, Big Mammas, Honey Delights, Amish Paste and cherry tomatoes. The tomato crop is quickly slowing down. Do you ever wonder if we stab any potatoes when digging? We sure do. We take them in the house and wash them up to be used ASAP in a variety of our favorite potato dishes. Potatoes – Reds are Viking and Pontiac, brown-skinned – Kennebec and blues in your box this week. Since the potatoes are plentiful here are some recipe ideas. Pumpkins put a smile on everyone’s face. Pumpkins – One large pumpkin and smaller ones for the kids. Happy carving later this fall! Gourds – A few more for you this week. Hydrangeas, Sedums and Zinnias this week. Fresh cut arrangement – Hydrangeas, Zinnias and Sedum tonight. The Hydrangeas and Sedum will make dry arrangements and last through the fall. Next week you will receive shocks of corn for your fall decorating so be prepared. This weekend we donated our extra tomatoes to my sister-in-laws’ Food and Consumer Sciences (FACS) classroom. We knew she was planning to teach the high schoolers how to make salsa. Garden fresh tomatoes will provide a number of good learning experiences for these students: always remember to wash your produce – even when you buy it at the grocery store, even thought a tomato may not be perfect it can still be used by simply cutting the blemish away (if it is moldy it should be thrown in your compost pile), and how do you even slice the tomato without squishing it (use a serrated knife, a bread knife, it works slick!). I thought some of you may also appreciate a few of these tips, which I have outlined below. Tomatoes are not always perfect. But did you know that even those with cracks like this or brown blemishes can be used? Using a serrated knife, cut off the bad part. Use what is remaining. It’s still delicious and perfectly healthy for you. If the tomato has ruptured, is moldy or smushy – throw it out or throw it in your compost pile. But this one, I am enjoying at my next meal. Pumpkins etched with Care for your Families. Thank you for being a member of our CSA! The other night when we were working, I had the Happy station playing on Pandora. The songs were those that made you want to sing and dance. So the boys and I were singing and dancing like no one was watching. Their smiles and laughter were contagious, and the stress and our exhaustion from our days seemed to be pushed away. It reminded of me of picking rock when I was growing up. Those were some long days in the field. Rock picking can be long, hot, boring work, but when we blared the radio on the tractor, the singing and the dancing ensued and laughter followed. As we push for our fall cleanup to be completed, it’s these moments that I want to freeze in time. Time to be crazy, time to accomplish, time to learn and explore and time to have fun, all as a family. Remember in the end, your kids simply want to laugh and play with you and dance like no one is watching. Garden clean-up has begun. The boys used a shredder to break down the plants so that we can incorporate them into the soil. So are you wondering how the names are created on your pumpkins? It begins at the end of July/beginning of August. The boys carefully select pumpkins that they think go with the amount of letters in your last name, and a pumpkin that will grow to be a nice size for your front porch. Then using their great-great grandpa’s wood working tools that were hand carved, they carefully etch out your last names in the pumpkin. This will then appear as a “scar” on the skin of the pumpkin. A great way for the boys to work on their spelling, their letter writing and how to work gently with a young plant. Green Beans – A little taste – We were surprised that the new crop of green beans and sugar snap peas were not quite ready. Both are blooming and those blooms will grow into the vegetables. Hoping next week. Broccoli – Broccoli for your salads. Kohlrabi – Maybe one more week?? Beets – Enjoy the beets before they are all harvested. Cucumbers – Enjoy the “ugly” cucumbers:) The tail end of the cucumbers. Tomatoes – Tomato varieties included in your boxes: Yellow Girls, Honey Delights, Big Boys, Roma, Fourth of July, Big Mammas, Honey Delights, Amish Paste and cherry tomatoes. The tomato crop is quickly slowing down. Let us know if you would like any to freeze or can. Potatoes – Midnight Moon and Masquerade in your box this week. Additional varieties will reappear next week. Learn more about potatoes here. We broke of the bad parts of the corn that had ear worm. Then boiled the good sweet corn for about 8-10 minutes and cut off the corn to freeze and enjoy throughout the year. Sweet Corn – After finding the earworm in way to many ears, this crop was shredded and will be incorporated into the soil to build soil health. We are looking into our options to prevent this pest next year while providing more sweet corn for your families to enjoy. We did salvage the good part of our ears, boiled them for 8-10 minutes in boiling water, cut the corn off the ears and froze the corn for us to enjoy the rest of the year. Basil – Pull a plant, replant in your garden or use it fresh. Melons – Choice of watermelon or cantaloupe. This is the end of the crop. Enjoy! The boys had a great time harvesting your name pumpkins. Pumpkins – The boys enjoyed etching your names into the young pumpkins a few weeks ago. So while they may not look exactly perfect, please know they were done with much joy for each of your families by the boys to show gratitude for your families to enjoy this fall. What a variety of gourds we have this year. These two resembled snakes. We hope you enjoy your share. Look for more next week. Gourds – A variety of them abound from Baby Boos to egg gourds to Jack-Be-Littles and more. Enjoy your share this week and look for more next week. The ornamental corn colors are beautiful. Fresh cut arrangement – Ornamental corn – one bunch for each of you. This crop was beat up by winds and a few storms this year. We plan to increase the amount of plants planted next year. A family favorite! I freeze and use throughout the year in recipes that call for pumpkin. 1. Using a butcher knife, split the squash in half lengthwise. Place in a cake pan, put about 1/4 – 1/2 inch of water. Cover with aluminum foil and bake for at least an hour at 350 degrees Fahrenheit. 2. Remove from oven. peel off the skin using a knife or turn it over and scoop out cooked squash. Scoop out and remove the seeds – discard (seeds could be cooked using a pumpkin seed recipe). 3. Place cooked squash in bowl with 1/2 cup of stick butter and 3/4 cup of brown sugar. Mix and enjoy. Squash mixed up and ready to be eaten or frozen. I freeze mine in cupcake tins, after they are frozen I put them in a Ziploc bag and pull them out as needed for meals or when a recipe calls for pumpkin. 2. Remove from oven. peel off the skin using a knife or turn it over and scoop out cooked squash. Scoop out and remove the seeds – discard. Or seeds could be cooked using a pumpkin seed recipe. 4. Once squash is mixed up and ready to be eaten or freeze in cupcake tin. After they are frozen I put them in a Ziploc bag and pull them out as needed for meals or when a recipe calls for pumpkin. Many treasurers are being unveiled underneath the vines. Including some very beautiful gourds, squashes and pumpkins. It’s hard to believe it is nearly mid-September, and the growing season is coming to an end. A few thoughts on this growing season. The insects have been challenging on several crops this year including cabbage, cauliflower, summer squash, zucchini, and the vine crops. We were thankful that the insecticide which was labeled as organic worked effectively on the potato bugs. White mold was a challenge on the vines. These pests put pressures on the plants which decrease the amount and quantity and/or quality of the vegetables that are harvested. We will continue to research solutions for good plant genetics to withstand the variability of weather situations that plant growth faces, build soil health, control insects and plant disease challenges while sustainably growing stronger plants which produce healthy delicious produce. Due to the blessing of regular rains which cause the plant grow more rapidly, we missed the window of opportunity for staking our tomatoes this year. We will work not to miss that again. Staking the tomatoes makes them easier to harvest and cleaner at harvest. Thankfully we were able to stake the peas and cucumbers. Peppers were interesting again this year. Many varieties did not grow or simply didn’t produce the quantity we had hoped for. The exception have been the Habaneros. Squash varieties either died off early due to insects or a plant disease. So unfortunately, we did not get the quantity of summer squash, butternut squash (you will receive this soon), spaghetti squash (none survived the pests that we have found) or even zucchini. More are planned for next year. The melons we planted from seed did not grow so we ended up buying plants. I am looking forward to next year, and the possibilities of some even more flavorful varieties. All of the above may sound a bit overwhelming, but in reality its exciting possibilities of new opportunities and challenges to learn more about Mother Nature. All while teaching the basics to our children and bringing to reality, lessons on reading, science and math through the study and exploration of agriculture. According to the Southern Research & Outreach Center in Waseca, this growing season has seen abundant rainfall. As of earlier today, the research station accumulated over 30 inches of rainfall during the growing season (May through September.). This is only the fifth time since 1915 this has occurred. All five of these 30-plus inches of rainfall growing seasons have taken place since 1991. Corn Earworms – what a disappointing site to find in the corn. We did not use any insecticide on the corn, and since this is a later harvest for sweet corn, the probability for this pest increased. Breaking the affected part of the ear off and boiling the good part of the ear of corn is a solution to salvaging the good area. Unfortunately, if much of the ear has been affected disgarding it is recommended. Learn more about this pest here. A lot of insects were found today. We believe this one to be a bald white faced hornet. Look closely, and you will see it enjoying a spoiled cantaloupe. Lettuce and Spinach – New crop looks delicious. We hope this will last us until the end of September. Carrots – Interested to hear what you think. These carrots came out of a different soil type then the ones earlier this summer. Your feedback is appreciated. Green Beans – A little taste – a new crop of green beans and sugar snap peas next week. Broccoli – Legacy Broccoli, hybrid. This is a broccoli that is good for growing during the warmer part of the summer. What is a hybrid? Learn more here. Kohlrabi – We may get one more week of this. Beets – The beets will be coming to an end in a week or two. Peppers – Watch out a few of the small Habanero peppers. They are mighty. Here’s a Habanero Salsa recipe. The tomatoes were a little dirty at harvest this week due to the recent rain. We had 8/10ths of an inch early Tuesday. Tomatoes – Tomato varieties included in your boxes: Yellow Girls, Honey Delights, Big Boys, Roma, Fourth of July, Big Mammas, Honey Delights, Amish Paste and cherry tomatoes. The tomato crop is quickly slowing down. Let us know if you would like any to freeze or can. Learn more about tomato research. Potatoes – Midnight Moon and Masquerade in your box this week. I enjoy using these varieties however I enjoy potatoes! Math is used frequently in the CSA. Including reinforcing adding and multiplication when bagging sweet corn. Sweet Corn – We will be checking for corn earworms to determine if we will have another round next week. These little pests made an appearance in today’s harvest. We did not use any insecticide or other methods to control this pest. Learn more from the University of Minnesota. Cilantro – For some fresh salsa with your tomatoes. The boys were busy harvesting this year’s remaining melons. Melons – Choice of watermelon or cantaloupe. Enjoy! The butterflies and bees abound on the flowers. Fresh cut arrangement – A variety from sunflowers, straw flowers, and zinnias. We love using our extra watermelon up in smoothies. We will freeze the extra watermelon to use it later when the meal simply “calls” for smoothies. Follow the link to Martha Stewarts’ site for pickled watermelon rinds. Several of you have mentioned the idea of doing this. In the mean time, sit back and try a smoothie. Put watermelon, strawberries, lime juice, ice and sugar if desired into the pitcher of a blender, and blend for 15 seconds on high speed. (Always put the top on the container before processing.) Stop machine, and stir ingredients with a long wooden spoon. Blend for 15 seconds more on high speed. This past weekend, I had the joy and pleasure of teaching a young girl how to pick flowers. Picking flowers is a skill that I have taught my boys and my husband, and something we all take for granted. Much like the boys teaching other kids how to harvest carrots. As I reflect on these experiences, I am reminded of why we encourage our boys to teach something each week in the garden. 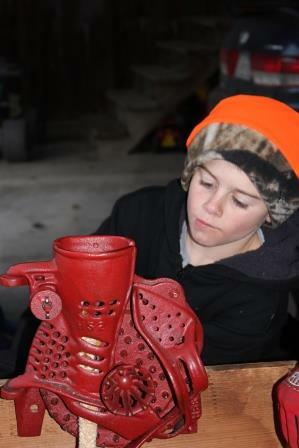 You see each week during our growing season, we encourage the boys to share something that is new or different that is “growing” on in the garden from insects to soil types to seeds to harvesting vegetables to eat on the way home etc. We encourage our children to continue to share the farm story wherever an opportunity is available, and they continue to amaze me. Farm Fact: Over half of all Minnesotans have never met a farmer. Keith working at the state fair sharing how farmers care for the animals, the environment and producing food for families in our neighborhoods and around the world. This week, Keith joined me at the Minnesota State Fair at the Minnesota Farm Bureau booth answering consumer questions and providing an opportunity for consumers to meet a farmer. He also worked at the Minnesota Farm Bureau Foundation’s Ag Cab Lab in the CHS Miracle of Birth Center helping families to better understand ethanol, and what it is like to drive a tractor. He had a great opportunity to help share what Minnesota Farm Bureau is doing at this year’s Minnesota State Fair on WCCO TV. Sam shared how the chicks that were hatched at the Montessori have grown, and taught the children how to tell the difference between roosters and hens. This past school year, we hatched chicks in both of the boys’ classrooms. This summer, we brought the grown chickens into school to share with the children and show them how quickly poultry and animals change – a great science lesson! Sam did a great job leading this sharing time and describing the differences between roosters and hens. While there are many different types of farms across Minnesota and the United States, we are happy to share our story with those who are interested and to help answer questions that you may have or connect you with farmers that would be able to answer them. You see the reason we enjoy sharing our story is because we like to see the joy in the faces when people connect and better understand. Much like the joy in a young girls face when she better understands how to harvest and pick a beautiful bouquet of flowers, or the smile on boys’ faces with their mouths outlined in dirt after eating freshly harvested carrots. We spend quite a bit of time trying to identify insects. A cool one we found this week was the hummingbird moth. Learn more here. Green Beans – A little taste – a new crop of green beans and sugar snap peas in the coming weeks to finish out the year. Check out this segment on America’s Heartland on green beans. Kohlrabi is also starting to thin out. Cucumbers are starting to come to an end, but we still filled a wagon full. Cucumbers – This crop will also be ending shortly. Peppers on the other hand are producing. There are a few varieties to choose from. Peppers – A variety – enjoy! Watch out a few of the small Habanero peppers. They are mighty. We picked just a few tomatoes. If you would like to can or freeze extra to enjoy later. Please let us know. Potatoes – Kennebec, Viking and Blue potatoes for your Labor Day holiday for Red, White and Blue potato salad. Sweet Corn – Will return in a week or two. Basil – A little for your potato salad. Red or Green Cabbage – Here is a coleslaw to give a try at your weekend picnic. Check out the links above for some tasty recipes. I was thinking, “What did I make from the garden this week?” I was reminded of this trusty favorite. This is a family favorite and an easy way to use many of your fresh or frozen vegetables. Cook in 350 degree Fahrenheit oven for 1/2 hour or until edges are bubbling. Enjoy! Enjoy! Sometimes the boys like to eat it with ketchup on it. Boy the summer is flying by. Finally stopped to take a photo of how bountiful the crops look. The seasons are quickly changing and so are the colors in the garden. The melons, pumpkins, winter squash and gourds are turning color and will create a fun treasure hunt sooner than later. It’s hard to believe that another growing season will come to a close in about a month. Next time you are here, we invite you to enjoy the beautiful colors in the garden. It really is quite peaceful in the evening. If you are feeling overwhelmed with the produce, this is a great time to think about freezing or canning to preserve the vegetables to use later this year. Here is a great resource from the University of Minnesota. Our last round of cold season crops are just about ready to harvest. The recent weather has leant itself to good growing conditions for these plants. Believe it or not, we have already started some garden clean-up – putting to rest the end of different plantings of crops. But don’t let that fool you, there is a bounty of food to still come such as potatoes, melons, winter squash, tomatoes, pumpkins, gourds etc. It is exciting to see the culmination of our efforts, but sad in a way, because we have enjoyed the array of colors in the field, and the excitement of finding something new every time we are out there. Stay tuned to see what Mother Nature has in store for us, and the bounty that is still to come. Did you know that you can collect the seeds from your Marigolds. Check it out, inside dead or dried up flowers are the seeds. Plant them and watch them grow. Same with the Four O’Clocks. After the flowers have dried up and died, the seed (black spot) is ready to be planted. So fun to watch the cycle of life on your flower plants. It was nice to see the young lettuce and spinach growing in the garden and ready for your BLT’s and salads. Enjoy we have more growing around the garden. Lettuce and Spinach – New crop with more to come next week. Sugar Snap Peas and Green Beans – A little break on this crop. We are waiting for the fourth crop of Sugar Snap Peas, and the third crop of beans to be ready to harvest in another week or two. Broccoli – We made broccoli cheese soup this weekend – see the recipe of the week. Beets – Loving the beets and hearing how you are using them. One of our shareholders mentioned smoothies for an option for people in her house that claimed they didn’t like beets. Here’s a recipe to try! Just a few cucumbers this week. We harvested some dill to try some more pickle recipes, and a melon to see if they were ripe for the picking. Cucumbers – Plenty of cucumbers. So many cucumbers that we canned a few different pickle recipes. Here are a few ideas Taste of Home or canned dill pickle recipe. Peppers – A variety abound – enjoy! Watch out a few of the small peppers are mighty. A little “air” time digging potatoes. Potatoes – Kennebec is a great baking potato. Viking potatoes are great for making boiled or mashed potatoes. Cilantro – We hope you are enjoying some salsa or other delicious dishes. With all of the broccoli harvested this summer, I finally had a chance to try out some homemade soup. This week’s chilly fall-like weather leant itself well for this experiment. The recipe tried was the Pioneer Woman’s recipe. We liked it and would definitely recommend lots of pepper. I think that is the key! The boys used one of the beets that was way to small to make warrior paint. Our evening concluded last night with, Sam falling asleep at the table while eating his supper, and Keith going to bed with a smile on his face. You may be wondering why did Sam fall asleep at the table? You see we ate supper at 9:30 p.m. This is not unlike what I grew up doing on our family farm, or what I know other farm families do. You see we harvest some of our crops the evening before pick-up (cucumbers, sweet corn, tomatoes etc,) and early in the morning of the day of pick-up trying to avoid harvesting during the heat of the day. 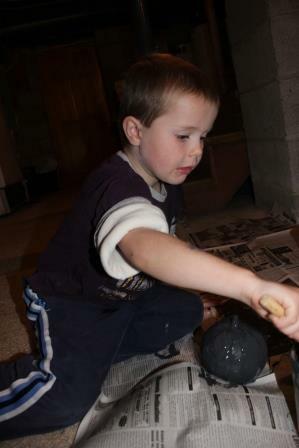 We arrived home from our off farm jobs and the boys activities. All of us were exhausted. We all would have much rather played catch or laid on the couch. But we knew the work needed to be done, so we grabbed a Schwan’s ice cream bar which always brings a smile to the boys faces and headed to the field. I tried to keep everyone focused and separated to avoid the exhausted brother fights. Once Steve arrived, we split into harvesting teams allowing for one on one time with our kids. Just us and Mother Nature on a beautiful summer evening having good conversation with our kids, marveling at the interesting finds in the garden and enjoying the beautiful color of the sunset. As we cleaned up for the evening, everyone’s moods had changed for the better. They were happy, peaceful, helpful and calm. So while I was concerned at the time we were eating supper, all of us felt good at what had been accomplished. As I put our oldest to bed, I mentioned to him how peaceful he looked, and how the exhaustion and angst were gone. He agreed that the time spent together outside brought peace and was a good way to end the day. So now you know one of the many reasons farm families don’t mind the late meals together after working to accomplish a bigger task. When I reflect back on my childhood, I remember those times with fondness and know that those were the days that built character, good work ethic and team work. The seed potato can be seen at the base of the plant. So cool to see how the roots and the plant have grown from this and to find the delicious potatoes that it has grown. A young potato is attached and growing from the seed potato that we planted this spring. This is what we got when we pulled the potato plant out of the ground. There were a few more potatoes that were in the ground. Look closely and you can find the seed potato. Red Oak Leaf Lettuce – Beautiful red lettuce leaf. A new crop of lettuce and spinach has emerged. Hoping that it will be ready next week. Kale – I will be trying this vegetable in place of lettuce this week. Green Beans/Purple Beans – A more manageable amount to try to freeze this week. Sugar Snap Peas – Our third crop of peas was ready this week. Enjoy! Beets – Some history on this crop. Cucumbers abound we have Fanci Pak and Slicing Speedway (a lot like Straight 8). Cucumbers – You received both varieties of cucumbers this week. Let us know if you are in need any for canning. Potatoes are like digging for gold. Tons of fun and hard work! Potatoes – Kennebecs – You’ll be enjoying potatoes for the rest of the season. Sweet Corn – One of my favorites. Here is a way to freeze the corn before it gets to old in your refrigerator. 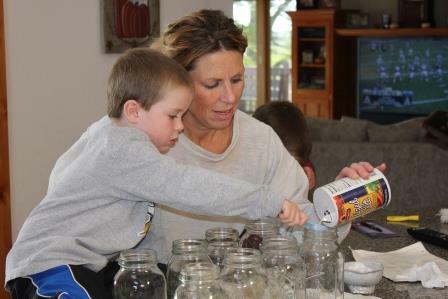 Dill is available for canning, and it helps to draw in beneficial insects. We enjoy reading a lot of children’s agriculture books learning about different aspects of farming. One of our favorites is The Boy Who Changed the World. Give it a read – it’s a great way to get kids thinking about people around the world, and how they too can make a difference. In a large bowl, combine the flour, cocoa, baking soda and salt. In a small bowl, combine the zucchini, sugar and oil; stir into dry ingredients until blended. Stir in walnuts and vanilla. Pour into a greased 13-in. x 9-in. baking pan. Bake at 350° F. for 35-40 minutes or until a toothpick comes out clean. Cool on a wire rack for 30 minutes. In a large saucepan, melt butter; stir in sugar and milk. Bring to a boil over medium heat, stirring frequently. Cook and stir 1 minute or until smooth. Remove from the heat. Stir in chips and marshmallows until melted and smooth; add vanilla. Spread over brownies. Sprinkle with walnuts if desired. Yield: 2 dozen. Happy kids and a great way to feed them zucchini and applesauce! While the harvest is complete, projects are still ongoing. Here is what we have been up to. Well, we shelled some of the strawberry, blue and white popcorn. Every variety needed to dry some more especially the blue and the white. There was simply too much moisture in the kernels. They wouldn’t even pop. You could tell they were planted later than the strawberry variety. So we have a fan blowing on the ears trying to dry down the kernels. Look at what happened to the tomatoes that Sam and I put in the garden. We had a lot of luck with them this year. 3/4 of them ripened. And we were able to use many of them to make tomato sauce. 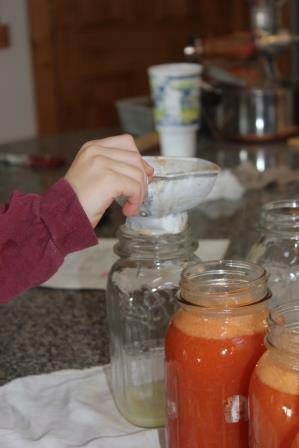 We took some of the green tomatoes that we ripened in the basement along with some we had frozen, and we put them through our juicer to make tomato juice. 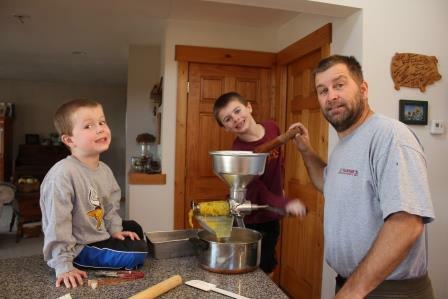 The best part of the day was listening to the boys ask their dad about where the canning supplies came from, and Steve telling them all about his memories gardening and canning with his Grandpa and Grandma Gifford. 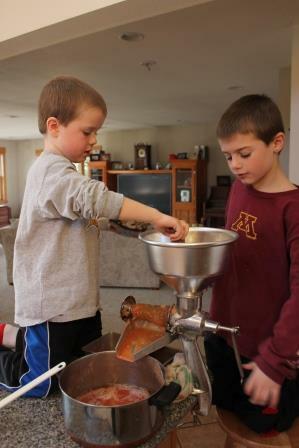 The boys were so proud that they could operate the juicer all by themselves. They even commented on what great teamwork they were doing. So fun to see how proud they were of what they were accomplishing. After juicing the tomatoes, they are put on the stove and brought to a simmer. 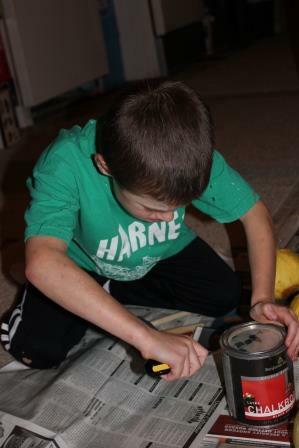 Next we added a teaspoon of salt and a tablespoon of lemon juice to each jar that had been sanitized. Next Keith helped to fill the jars leaving about an inch of head space between the juice and the lid. We wipe the top of the juice filled jars with a clean cloth. Then after boiling the lids for about 3 minutes, we use a magnet to place them on the jars. Next we screw on the jar rings and place in a pressure canner. 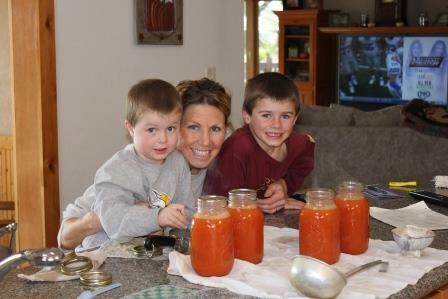 We were fortunate to have all of the jars seal so that we have them to make pizza sauce, spaghetti sauce and simply tomato sauce for the upcoming year. Now that Halloween is over don’t through your gourds out. I love Thanksgiving and the option to keep the garden items around for another few weeks. 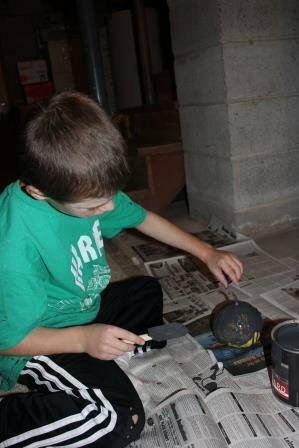 We painted the gourds with chalk paint. this would be a cute idea to paint them with chalk paint and use as name cards for your Thanksgiving table. Place chalk by each place setting, it may provide for some interesting entertainment during the holiday meal. The boys and I decided to paint a few of the larger gourds with chalkboard paint. Keith helped open the can and mix it. Keith and I painted on one layer of paint and let it dry. Sam and I painted on a second layer. Sam also had the idea that we should paint a green tomato with chalkboard paint…so we did. 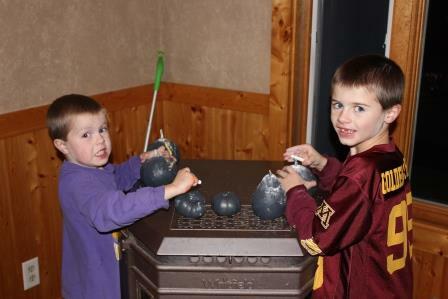 The boys had fun coloring the gourds and the tomatoes painted with chalk paint.